Part 3 of Ben Downing’s meeting with Paddy in 2001 at Kardamyli. Read Part 1 here and Part 2 here. Before I’d set out, Annie [Fleming, wife of novelist Ian] told me that “Willy” had asked her to stay and to bring anyone she liked (so why not me) and when she got to the Villa Mauresque she rang up, announced the O.K., and collected me in a borrowed car. The Feast of the Assumption! You know that huge picture in the Louvre, I think by Correggio, with the Blessed Virgin whirling into the sky as though shot out of a gun through a dozen rings of cloud, and scores of seraphim and cherubim? I’ll never forget the reaction of Robin Fedden—he had a charming stammer, and he exclaimed, ‘That’s what I c-call an unw-warrantable as-sumption!’” Soon after we were bidden indoors for a delicious dinner. After the guests had left and we were enjoying a nightcap, Mr Maugham got up, shuffled across the Aubusson, and with a limp handshake said—I won’t indicate the stutters any more—“Well, I will say goodnight now and perhaps I should say goodbye too, as I expect that I will be in bed tomorrow when you leave,” then ambled off. It was encouraging to hear, later on, that Cyril [Connolly] had once been made to leave the house for picking and eating the last avocado off a tree on the terrace. But I learnt, later still, that this was only a consoling rumour. He was scolded, but allowed to stay on. “A few days later I went to see Darryl Zanuck in London. He was smoking a large cigar in his suite at the Savoy. He handed over a copy of the book, and we planned to meet again in a couple of months. I spent the first month under the Duff Coopers’ friendly roof at Chantilly, playing boules along the lime avenues of the château between writing sessions, and the second on the Greek island of Andros. Then, with considerable misgiving, I flew back to London with the results. I left the script for Darryl at the Savoy and, next day, found him pacing up and down his suite with a still larger cigar. It was raining over the Thames below. ‘I’ve read your treatment, Femur,’ he said at last. I asked him if it was any good. After a pause he said, ‘It stinks. It’s a whole lot of crap.’ Then, to make himself quite clear, he said, ‘It’s no good!’ It was a bit what I felt myself, and it was rather a relief to have so clear-cut a verdict; I could now go back to my own abandoned tasks. “But after Darryl had walked up and down once or twice more in a cloud of smoke, he halted and said, ‘I’ll tell you what we’re going to do, Femur.’ He took another pull, and continued, ‘We’ll go over to Paris the day after tomorrow—that’s where I’m based, at the Hôtel Georges V—and we’ll get you a comfortable suite there, like this one, with plenty of room and a bottle of whisky and a nice typist. We’re going to the races.’ I’d never heard the metaphor, but that’s more or less what we did. I said I would be happier at the old-fashioned Hôtel Saint James et Albany in the rue de Rivoli (dismally modernized since) instead of the gigantic Georges V. No difficulty about that. He asked me if he had got my name right, and I said, ‘Nearly. But Femur sounds a bit too visceral.’ He laughed, and we changed to first names and started work the next day. “I would write in the Saint James all morning, get the nice typist to thrash it out, and walk to the Georges V in the afternoon, where we would go through the script scene by scene until I had more or less got the hang of it. After a week Darryl said he liked the way it was shaping up. But just as everything seemed set fair, Romain Gary mysteriously flew in from Los Angeles, where he was French Consul General. He was a nice man, but urgent and highly strung and, as Darryl ominously said, ‘very film-minded.’ He changed all the scenes we had been toiling at, then flew just as mysteriously back to California. So we started undoing the script and rewriting. Nevertheless, this was all very exhilarating; our sessions would end in drinks and, sometimes, delicious dinners. “Set free at weekends, I changed gear and drove out to Chantilly, where a spirited friend called Jean de Souza-Lage lent me a splendid horse, and we would set off for the meet of staghounds at one of the nearby châteaux. The women wore blue and gold tricornes, and the resplendent torsos of the men were encircled slantwise by those curling French hunting horns, whose slightly sad and moving fanfares mark the stages of the chase. ‘Dieu! que le son du cor est triste au fond des bois!’ as Alfred de Vigny wrote. There was something deeply romantic about ranging through the molting late-autumn woods, dotted with misteltoe, with those notes in the air. “John Huston arrived at last and we were soon on the wing. France rolled away underneath, then the Mediterranean, followed by the khaki blankness of the Sahara. We landed at Fort Archambault on the shore of Lake Chad and headed for Maroua, in what was then French Cameroon. Here scores of conical straw huts had been built for us, then girdled by a tall stockade to guard us from wild animals. The whole team—we were well over a hundred—assembled in a vast dining hall where meals were flown in twice a day from Paris. This strange and heteroclite community teemed as plentifully with gossip, cliques, minor feuds, brief love affairs, and cumulative jokes as if our abode had been up for centuries instead of two or three weeks. “John Huston was a tall, rangy, amusing, and versatile man with a strong dash of genius, and a demonic touch too. His life seemed to be split between his extraordinary films and cantering about the west of Ireland as master of that famous pack of foxhounds known as the Galway Blazers. On the first day of shooting he seemed a bit hazy about the plot (‘I don’t believe John has read the goddamn book,’ Darryl whispered) but not on the second. His mind teemed with ideas, and the minor changes suggested for the script brought home to me that a scriptwriter on location resembles a seamstress with scissors and a mouthful of pins. “As for Errol Flynn, I never tired of sitting up late with him in his quarters and listening to comic and hair-raising memoirs of his early days in Hollywood—especially tales of the Barrymore brothers—and his escapades aboard the yacht he shared with David Niven. One night, someone at dinner talked about female movie stars: which were the prettiest and which had the most adventurous private lives. He named three. Later, when we were alone, I asked Errol if he agreed. ‘Yes,’ he said. ‘I think that’s about right.’ Then, after a pause, he ruefully added, ‘They’ve all got my scalp, I’m afraid.’ Another day, scattered around a pool in swimming things, we’d all been talking about riddles, and asking them too. ‘I’ve got one,’ Errol said. He stood up stiffly to his full height, arms rigid at his sides, and asked, ‘What am I?’ Then, without moving an inch from the spot, he shifted round with his eyes and mouth tight shut. When he was facing his audience again, he reopened his eyes and mouth as far as he could for a few seconds, then clamped them both shut and resumed his rotations, interrupted by the same glare and gape each time he came round. Nobody could guess. What was he? Finally he said, ‘A lighthouse,’ and went on gyrating. It’s hard to convey how hilarious we found it. “The heroine of the film was Juliette Gréco, to whom Darryl was deeply attached. I had seen her earlier, spinning round dance floors like a beautiful raven-haired mermaid in caverns full of jiving existentialists in Saint-Germain-des-Prés. She was very well-read, loved literature, and was full of interesting and amusing stories about Sartre and Simone de Beauvoir. She was a friend, too, of Raymond Queneau, whose books I had a passion for, and we shared a taste for the poems of Jacques Prévert. We became close friends, and still are. “After three weeks, we flew to Bangui, in what was then still French Equatorial Africa but was soon to become the realm of the wicked Emperor Bokassa. The little town clustered on the north bank of the Obangui River, a tributary of the Congo, and on the edge of a dense rain forest full of elephants—our main theme. A race of intelligent smiling pygmies dwelt there, armed with bows and arrows, twangling cheerfully on strange stringed instruments known as equatorial pianos. “On the last day of filming in the forest, enormous black clouds gathered and then broke in a deluge. Instantly soaked to the skin, we drove slithering and sliding back to Bangui and its one hotel, a modern skyscraper soaring above the treetops like an upended mouth organ. The Obangui was in spate. Indoors, the lights fused as we entered, and the floor was nearly a foot deep under a gleaming mattress of broken-off termites’ wings. A hundred termite-eating frogs were leaping in parabolas among their prey, and Juliette’s mongoose was whisking about in this sudden abundance with frogs’ legs sticking out of its jaws on both sides, peering round for more. The thunder sounded as though the sky were breaking in half, and the shuddering flashes of lightning lit up a vision of diluvial apocalyptic pandemonium. In the end they compromised, with the happy result that the place is both modest and, in its way, grand. The showpiece is the immense terrace, among whose symmetrical red flagstones are interspersed a fountain with Seljuk affinities and elaborate mosaics, including a wind rose. Olives and cypresses lend shade, a first-century Greco-Roman tombstone leans against a tree, and scattered around the terrace are a multitude of nooks with stone benches and tables, ideal for secluded study. It is, in short, every inch a writer’s house, an oasis where, as Paddy phrased it, he can “stride about the olive groves for hours, putting sentences together and then pulling them to bits again.” One feature of which he is especially proud is the strategically placed reference section. “T. S. Eliot said that reference works should be close to the dinner table; that’s where arguments spring up which must be settled then or never.” The contents—dictionaries, encyclopedias, lexicons, atlases, concordances, Loeb and Pléiade classics, Oxford companions, Cambridge histories, and myriad books on art, architecture, and flora and fauna—testify to the range of learned dispute that has arisen at the table over the years. Kyrios Michali is how Paddy is known to most Greeks—“Mr. Michael,” roughly. I knew he’d acquired the tag while fighting with the Cretan resistance, but not how. “Patrick,” he explained, “is a foreign saint unrecognized by the Orthodox Church, whereas Michael, my second name, is their most revered archangel and commander of the heavenly host.” He added that on November 8, his name day, which in Greece counts like a birthday, much of the village gathers at a chapel dedicated to Saints Michael and Gabriel—twin archangels—and then repairs to the Leigh Fermor house for a giant party, with singing and Greek dances. The local esteem and affection for Kyrios Michali was nicely illustrated later that afternoon when, Paddy having retired for a nap, we decided to go hiking. Accompanied by the Leigh Fermors’ guest, an engaging German named Jochen Voigt, we borrowed their battered Peugeot station wagon and set off for the hills above town. As we negotiated a narrow track, the car suddenly died on us. Mechanical morons all, we walked a few hundred yards to the nearest hamlet and entered its only café, where a dozen or so men sat idly clicking their beads, sunk in picturesque ennui. In halting Greek, Jochen explained our plight and asked for help. At first his plea elicited only noncommittal grunts. Then he let drop that we were friends of Kyrios Michali. The reaction was immediate. “Kyrios Michali!” went the murmur round the café, and within a few minutes we found ourselves accompanied back down the road by a considerable posse of villagers, one of whom got the car running again—and waved aside our proffered tip. and so on through the remaining five stanzas to the end. The general’s blue eyes had swiveled away from the mountaintop to mine—and when I’d finished, after a long silence, he said: “Ach so, Herr Major!” It was very strange. As though, for a long moment, the war had ceased to exist. We had both drunk at the same fountains long before; and things were different between us for the rest of our time together. Back at the house later that night, we pored over a map of the Peloponnese with Paddy, asking his advice about where else to go. What did he think of a town called Leonidion, which I’d read good things about? “Leonidion!” he exclaimed. “It cowers under fantastic russet cliffs, and the inhabitants speak the Tzakonian dialect, which has many ancient Greek words that have been lost elsewhere. I remember it fondly—in April 1941 our caïque, the Ayia Barbara, was sunk by a German plane just offshore.” Instinctively I scanned this apparent non sequitur for sarcasm, but he was quite in earnest. 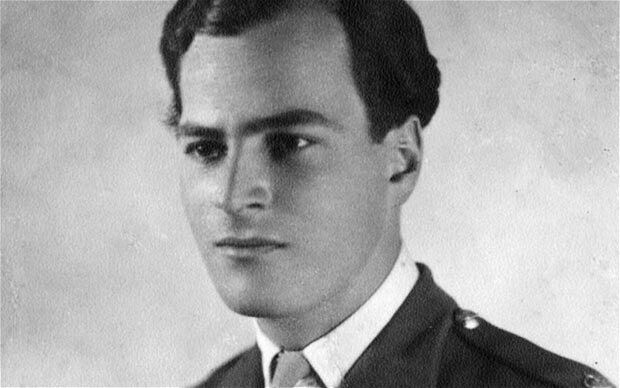 He explained that, while scrambling to retreat from mainland Greece to Crete, he and his comrades had bought—with a suitcase of banknotes, which the army had given them to help collect other troops in a jam—a series of caïques. They escaped from the first boat just before it was hit by a Stuka, the propeller of the second broke off just before reaching Crete, but the third got them there just in time for the battle. The next morning I briefly interviewed Paddy again, this time concentrating on travel writing–a term he loathes, but to which there is, he admits, no real alternative. So then: How did he do it? The most obvious explanation is that he has a more or less photographic memory; although he likes to complain of suffering from “onomastic aphasia,” his ability to call up images remains exceptional. This was illustrated for me when, the previous evening, I asked him about Wilfred Thesiger, who at ninety-two is the doyen of living travel writers. The reaction was instantaneous. “Thesiger! I last saw him several years ago, on a bus near Piccadilly.” Squinting as if to discern Thesiger more clearly, he then proceeded to give a thorough description of his appearance that day: his famously raptorial face; his school tie; his tightly rolled umbrella, with gloved hands crossed on the bamboo handle; the just-so forward tilt of his bowler. I asked him whether he was surprised at how much he could remember. “Pleased,” he said. And were memories of his walk brimming and available, or did he have to delve for them? Gingerly and uncomfortably, I probed around the matter of the incomplete third volume, which has been seventeen years in the making. Paddy seemed rather pained at the inquiry and allowed only that the sequel is creeping fitfully forward. One reason for the delay, I learned, is that he has decided to extend the book to include his 1935 adventures in northern Greece. Another is that his devoted editor and publisher Jock Murray, who used to chivvy him out of procrastination and even to come beard him in his Maniot den, died in 1993. Two related others, it would seem, are that he can’t resist the distractions of company, being incurably gregarious, and that he allows himself to be besieged by visitors. “I think highly of Jan Morris, Eric Newby, Norman Lewis, Colin Thubron, Bruce Chatwin, Peter Hopkirk, Nicholas Crane, Redmond O’Hanlon, and William Dalrymple, nearly all of them friends. But many others leave me cold, because the historical dimension is missing: to me it’s absolutely vital. Another strong influence on Paddy, I knew, was Robert Byron, now remembered chiefly for his classic The Road to Oxiana. What about him? “I suppose Gibbon is one of my favorite writers, and, contradictorily, it was he who led me to Robert Byron, whose passion for Byzantium and Greece was deeply infectious, partly because of the jokes and the fury. A very vehement writer, he didn’t answer criticism, but simply galloped over it roughshod and kicked it to matchwood, then rode serenely on. It was Byron’s book about Mount Athos, The Station, that prompted me to undertake a pilgrimage there in 1935. “We first met Bruce through friends in London, but got to know him much better when Xan and Magouche Fielding brought him to stay, briefly, in 1970. Then he returned for a long stay in 1985, installing himself in a nearby hotel (the same one you two are staying in) and working on The Songlines. He was highly organized, and brought with him these elaborate portable filing systems, which I greatly admired—but have always failed to emulate, I’m sorry to say. I must admit thinking that Bruce’s study of nomadism didn’t quite prove his case. But he wrote it very brilliantly, didn’t he, with his great Nijinsky leaps. “Most afternoons Bruce and I would knock off from our labors and go for walks in the hills. I was a very fast walker, but he completely outstripped me. He had very long legs, and used to simply whiz across the country. He was extraordinarily active, like a jack-in-the-box. Large social situations sometimes brought out a peacock side; he was much better when one was alone with him, or en petit comité. “When I visited Bruce and his wife, Elizabeth, in Oxfordshire during his last illness, I found him wrapped up in a blanket, his eyes exalted, with a sort of El Greco look about him and bursting with wild ideas. One of these involved my flying a helicopter to meet him at Mount Athos, where, as a first step toward his becoming a monk, I was to sponsor his entrance into the Orthodox Church—this despite the fact that I’m not Orthodox. Before we went hiking again that afternoon, we asked Paddy for directions to the chapel, but he said we’d never find it on our own, and that he unfortunately wasn’t feeling up to the excursion himself. A few hours later, we spied a dilapidated church in the distance and wondered whether it marked the spot where that most restless of spirits had finally found repose. Knowing I had a passion for Noël Coward’s songs, Sachie and Georgia, in spite of the general bad blood between Coward and the Sitwells, asked me to sing them, as though they were a secret and illicit enjoyment. Sachie occasionally closed his eyes and tut-tutted at all this anathema. While in Cairo he used to sing “It’s a Long Way to Tipperary” in both French and Hindustani, and “John Peel” and “Widdicombe Fair” in Italian. I’d heard that a party trick of his is to sing “Falling in Love Again”—in German, backwards. At dinner the third and last night, I asked him to oblige, which he exuberantly did, to much laughter from the table. Soon after, someone mentioned that, at a London party thrown by the Spanish ambassador on the occasion of Paddy’s eighty-fifth birthday, Norwich had sung for him a brilliantly clever adaptation of “You’re the Top.” The text of the song happening to be within reach, we persuaded a half-reluctant Paddy to sing it too. By two A.M., Paddy, fairly deep in his cups, had moved on to more exotic material. The talk had been ranging about the globe, and when it came to the Caribbean he suddenly burst forth with an elaborate, tongue-twisting song in the Creole patois of the French Antilles, which he remembered from his travels there more than fifty years before. The next day we stopped by the house to say our goodbyes, then headed down the coast into the desolately beautiful Deep Mani, as it is known, stopping along the way to consult Paddy’s compendious book on the region—over three hundred pages devoted to the tip of a single slender peninsula. Joan, who accompanied him on his explorations, had confided that hiking there in high summer had been “absolute hell,” and I could see why—there’s no shade for miles. Soon the vegetation begins to thin and the light to grow correspondingly clearer, so that one feels like a hawk, picking out details at impossible distances; in this the place reminded me of nowhere so much as the Andean altiplano. Architecturally, its curious keynote consists of the stone towers that loom up everywhere, alone or in clusters. From these bastions the Mani’s rival clans used to blast away at each other in their endless vendettas, but now they stand silent and often derelict; as is the melancholy case throughout Europe, only the old remain in the villages, and many of the hamlets we poked into were, like the one Keats infers from his Grecian urn, emptied and desolate. But the item that most caught my attention was, of all things, a 1995 article from The Cantuarian, the magazine of the King’s School, Canterbury, from which Paddy, after committing a raft of offenses, was expelled in 1931. The article reports that, on the occasion of his eightieth birthday, the school had sent greetings in the form of Latin hexameters, composed by one of its masters. They read, in part, as follows: “…Tibi laus sit bellica virtus, / Doctrinaeque decus, necnon audacia felix” (in the accompanying translation, “Be honoured for courage in war, for grace of scholarship, and, not least, for stylish daring”). Also quoted is Paddy’s grateful response in Latin prose, which concludes by saluting the master “ex ultima hac paene insula Laconiae” (“from this distant peninsula of Laconia”). There is much to relish here: the irony of his being embraced by the school that had sacked him more than sixty years before, which amounts to a vindication of prodigality and autodidacticism; the image of these outmoded Latin compliments winging slantwise across Europe, between Canterbury, with its suggestion of Chaucerian volubility, and Laconia, a province synonymous with stony reserve; and, of course, the underlying spirit of fun and gallantry and larkish jeu d’esprit. But above and beyond all this, the exchange strikes me as uniquely and irresistibly Leigh Fermorian. It’s just the sort of thing that always comes his way. This entry was posted in Interviews with Paddy and tagged Ben Downing, John Huston, juliet greco, Major General Heinrich Kreipe, Patrick Leigh Fermor, The Roots of Heaven on July 28, 2013 by proverbs6to10. This article by Ben Downing is very interesting and gives some insight to Paddy’s life. My Wife and I have met Paddy and Joan at their house in Kardamyli, I managed to take a photograph of him sitting in his favourite bay window but unfortunately he closed his eyes as I took the picture, but I still have it as reminder of our visit.